A great turn out despite the varying weather. Thanks to all that attended, we feel really pround to have all the hard work recognised. 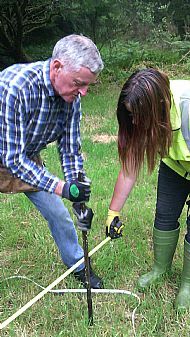 Remember: Every Friday and every last Saturday of the month is Volunteer (Half) Day – just come along to the cabin around 10am. 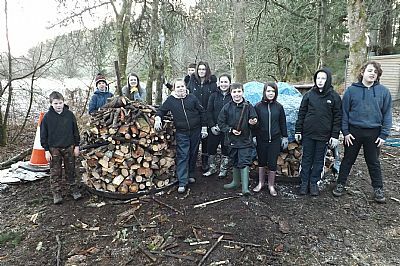 Tain Royal Academy Lend a hand at the shelter project. 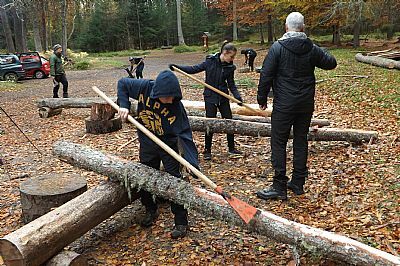 Pupils from TRA who visit the wood each tuesday, were called upon to help with some essential peeling work for the shelter project. It was all hands on deck to help peel some of the main beams ready to be treated. The groups was rewarded with some hot chocolate and finest biscuits. 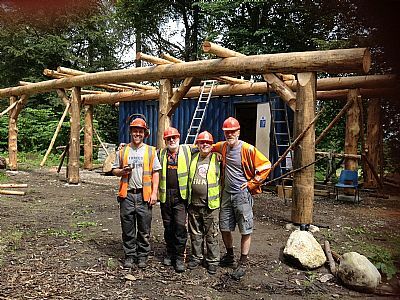 Work has started on the creation of a log built shelter at the Mag's Wood clearing at the western part of the wood. 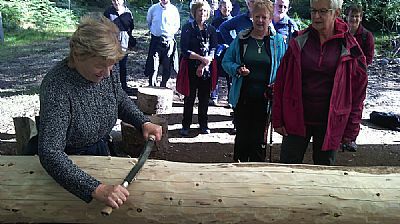 There are opportunities for people to take part in the building in particular chiselling the mortice and tenon joints. Phone 01349 830517. Paths for All consultation a great success. Paths for All came up from Edinburgh to conduct a consultation with our dementia group. 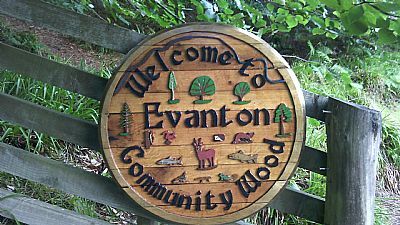 The aim of the session was to look at how Evanton Wood can best meet the needs of those with dementia and other challenges. In total 21 folk turned up to have their say and some great suggestions were put forward. Once these have been collated a plan will be put in place to see what changes we can do that are appropriate for the woods and group. 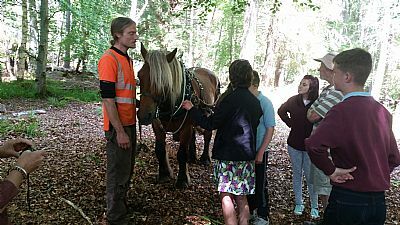 Staff at Evanton Coop assisted at the horse logging event and in the run-up to it. 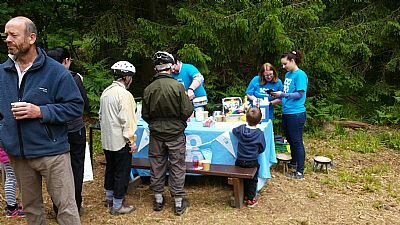 Between the Coop raffle and the sale of baking (ingredients provided by the Coop) we made £233.50 on the day - which will go towards the cost of the new log shelter at Mag's Wood. 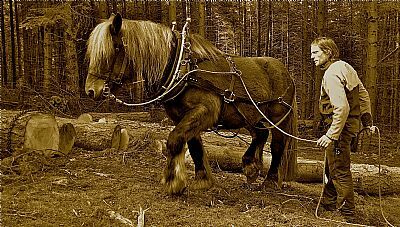 Horse Logging and woodworking event, a great success. Over 100 folk from near and far turned out to see Tarzan at work. 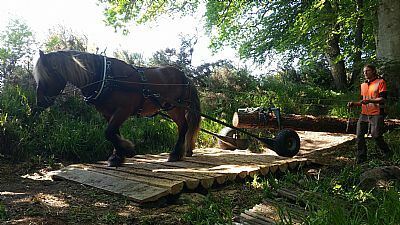 Tarzan's handler, Simon introduced everyone to the horse and showed how tarzan uses different trollies to pull the timber out of the wood. 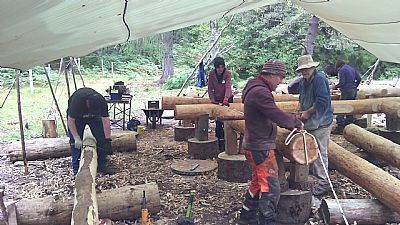 The green woodworkng area worked non stop with Alan, Davie and Adrian making stools, spurtles and wooden flowers. 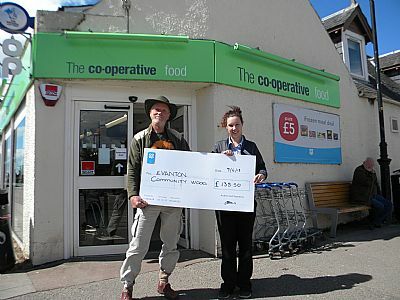 The Coop were on hand to offer refreshments and kindly donated prozes for the raffle. Our local pancake expert esther, made these in the hundreds and the baking stall (thanks Dee and Balndine) did a roaring trade. 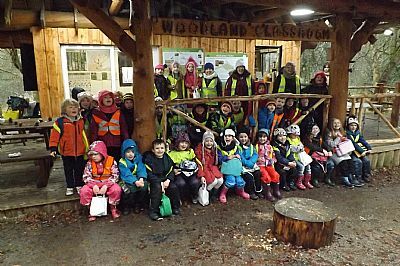 In total £230 was raise to support the work of the woods. Thanks everyone for your help and support. 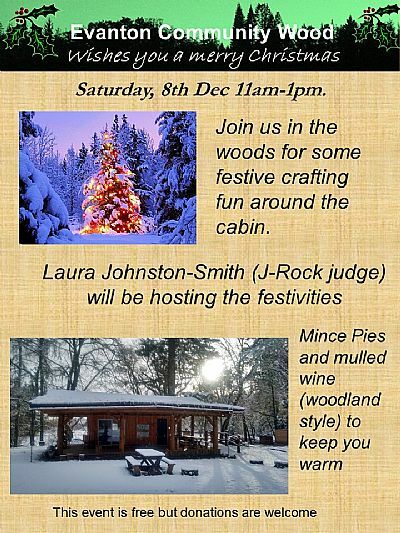 also Green Woodworking and Hamper raffle. Free. All welcome. Refreshments and Baking. Disabled parking. Toilet. 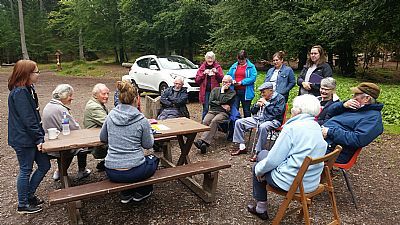 'Get Outdoors' Dementia programme and Kiltearn Nursery. a wee bit of colur added to the rocks. we finished the day with some rustic pencil making. 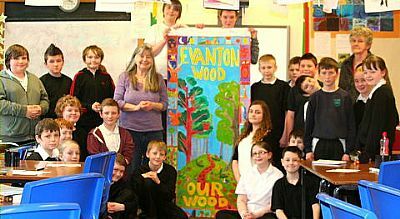 Evanton wood wishes to thank both the Life Changes Trust for supporting the 'Get Outdoors' programme. Volunteers get stuck into some bridge design and building. 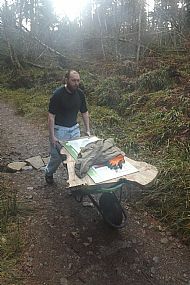 The Friday volunteer group had some first hand experience of design and build when helping to create a stable bridge near Mags wood. 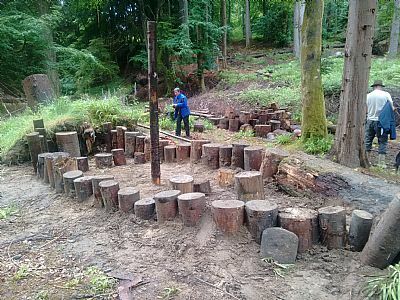 The bridge will cross a wet and muddy section of footpath and also aid the removal of timber when Evanton woods hosts a horse logger on June 7th -9th. 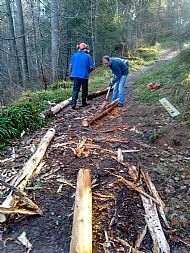 By using wedges and the power of Kennie and Dave, we were able to split large sections of Larch to use as the cross pieces on the bridge. 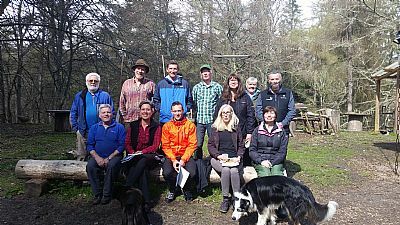 A big thanks to all the teachers that came along for the John Muir award training session delivered by Alan Smith, Cairngorm National Park Eduaction Manager. The weather was perfect, and all enjoyed the session and practical activities that Alan ran. 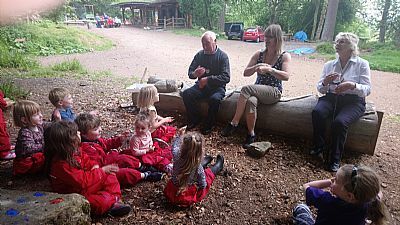 Thanks to Kennie for the woodland soup which everyone enjoyed. 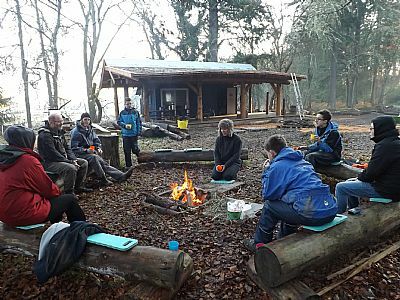 Our regular Monday group are in the process of completing their John Muir Award. 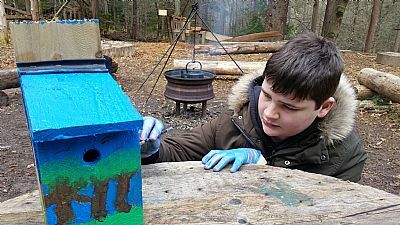 The group made birdboxes for the school, finished off with some great colours. The first frog spawn of the year has been spotted in the pond. Our local population have been busy and let's hope the cold snap doesn't upset the wee tadpoles' development. The weather has been variable to say the least but still our intrepid gang have been making it to our friday sessions no matter what. 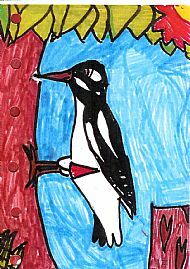 We have been making birdboxes for the local school, Kennie has been leading an art session and and Ian has been making twig picture frames. The food is still proving the most popular part of the session with chilli, dahl, spag bol and leek and potato soup being on the menu. 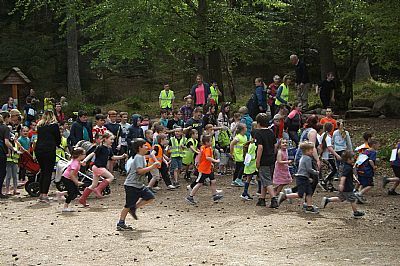 It was great to see the local primary school back in the woods. 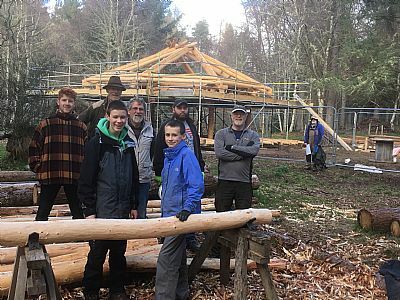 They braved the cold weather to do some management work (taking out small western hemlocks) then onto building their own shelters. The class is taking part in the Eden Project's shelter buidling competition, pictures of the finished designs will be submitted to the Eden project and we will cross our fingers. 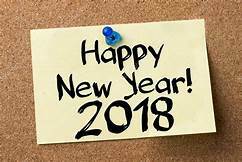 ALL SET FOR A BUSY 2018. 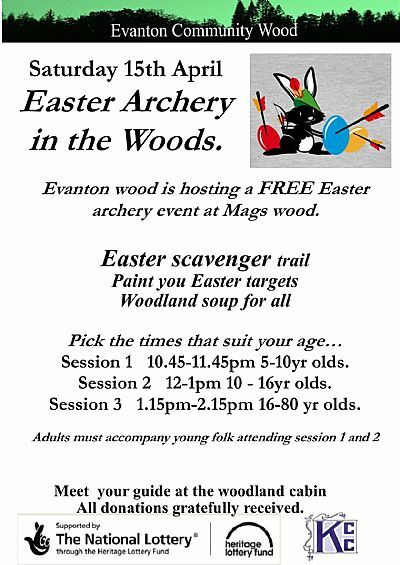 WE HOPE TO SEE YOU IN THE WOOD. 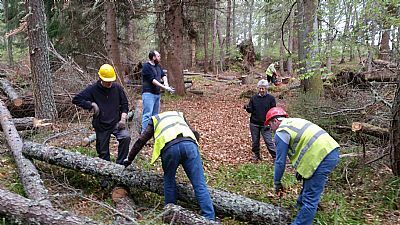 We hold volunteer days every Friday morning and every last Sat of the month (10am-1pm) to cut back the western hemlock, improve paths and drainage, plant native trees, clear and pile brash etc. All are welcome. 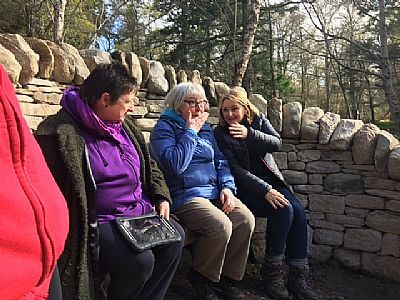 Restarted recently a regular programme for People with Dementia which takes place in the woodland cabin each Friday from 10.30am to 2.30pm. Running to mid April, then a break before following 10-week session. Carers are also welcome. Contact Simon Harry 079477 72066. See here. Also contact Simon re School Visits. 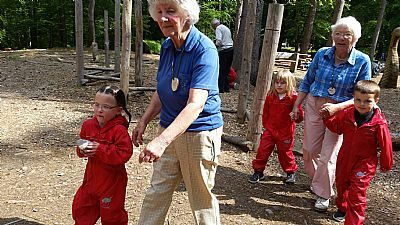 We also run a programme of occasional family and other events and walks and talks. See our website and Facebook page for details (links below). Membership is open to all aged 18 and over who subscribe to our aims. 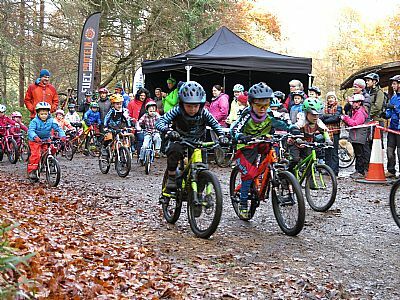 In partnership with Ben Wyvis Cycle Club, Evanton wood played host to the final event in the scottish dirt crit series. 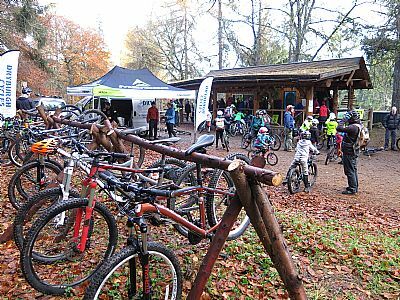 Turn out was fantastic with over 80 riders taking part and over 220 folk in total. Thanks to some lovely cakes from local bake off champions, a total of £122 was raised for the sale of these cakes along with teas and coffees. All the proceeds go towards the work done by the wood. Thanks to all the volunteers for making the event (the first of many) such a success. 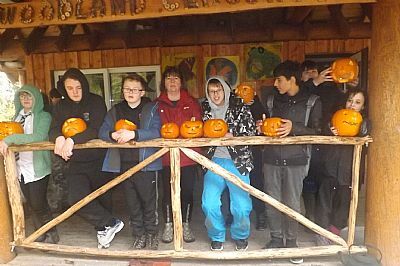 Both Dingwall and Tain Royal Academy groups spent a morning in the woods designing and carving pumpkins. Some great designs were achieved followed by homemade pumkin soup made from the leftovers....mmmmm was heard by all. 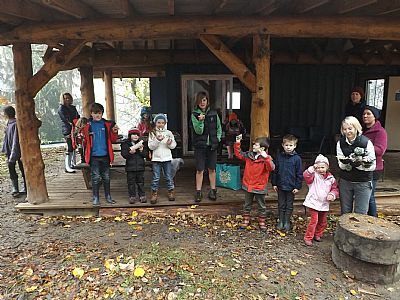 ‘The purchase and active management of the wood for the benefit of the community, in a way that maintains and enhances the rich and diverse environment, and develops its educational, recreational and timber resource’. 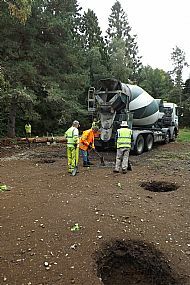 To manage the wood on a system of low impact silvicultural systems including continuous cover. 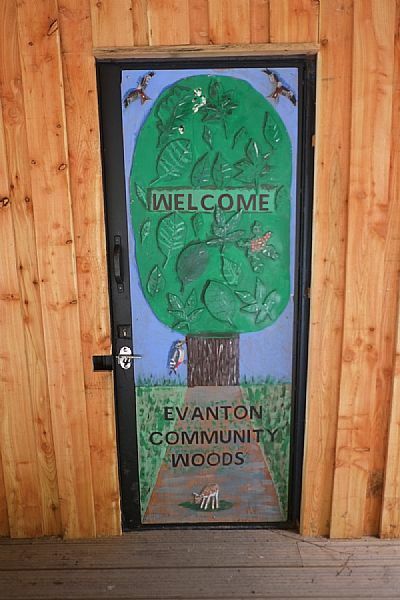 To increase the involvement of people in the wood, especially the local community. To encourage the biodiversity and enhance the beauty of the wood. 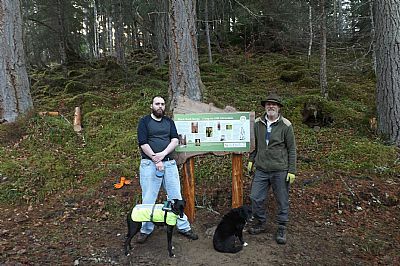 It was a 6 year process to engage with the community and gather the funds to purchase the wood and to run a 5-Year Activity Programme. We became the proud owners in August 2012 and took on a part-time Education & Outreach Coordinator soon after. 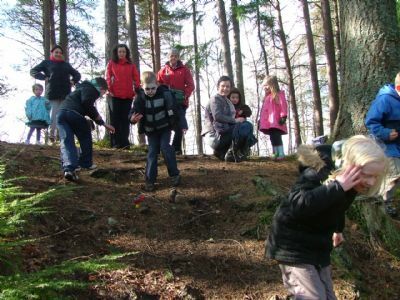 He is working with a wide range of local schools and groups to involve them in the wood in a variety of ways. 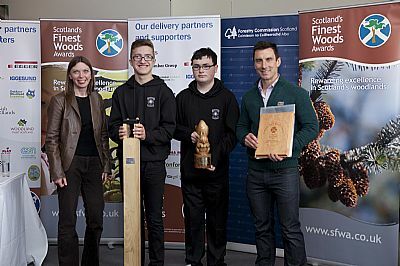 In recent years we are pleased to have won the 2 Scotland's Finest Woodlands Awards: The Schools Award (in conjunction with Dingwall Academy) and the Healthy Lifestyles Award. 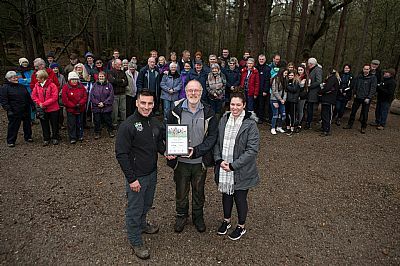 We also received a Highly Commended accolade from RSPB Nature of Scotland (2016) and were a Finalist in the National Lottery Awards Environment Category (2017). 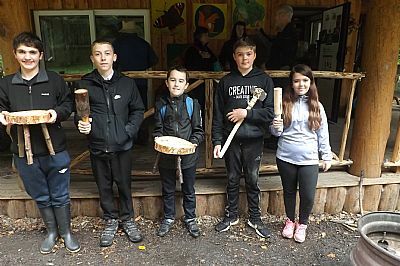 Pupils from Dingwall Academy have been hard at work building a replica Viking longship in Evanton wood. Trenches were dug and logs were rolled. 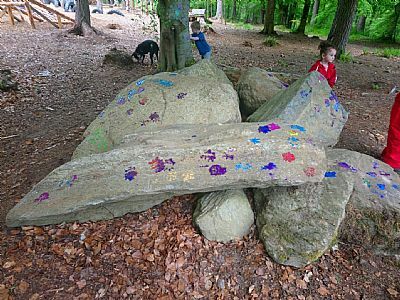 The ship can be used by all and offers a great opportunity for creative play. Thorstein The Red Viking gathers recruits at Evanton wood. 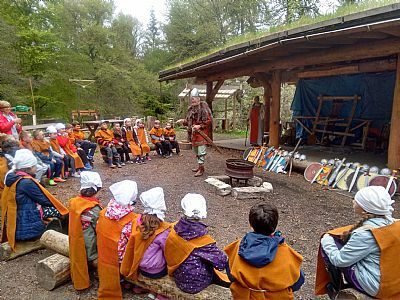 Pupils from Dingwall primary spent two days at Evanton wood learing how to be vikings from our very own Thorstein the Red. After being fitted for their very own viking costumes, the pupils learned some viking battle secrets, tried their hand at cooking some viking bread and made some viking shield art. Finally, a farewell recital in norse saw the group head back to school. A great day out had by all. 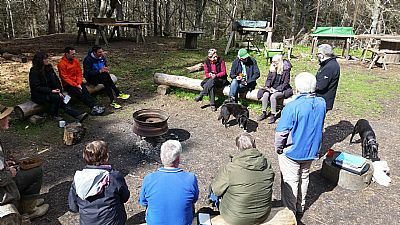 12 teachers from Ben wyvis Primary visited evanton wood to check out all the facilities and to hear Simon highlight all the outdoor learning possibilities for schools. A great session made better by the lovely weather. 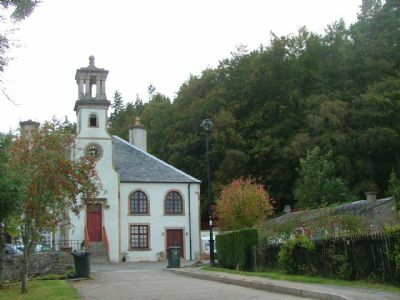 We look forward to welcoming Ben Wyvis pupils in the summer months. 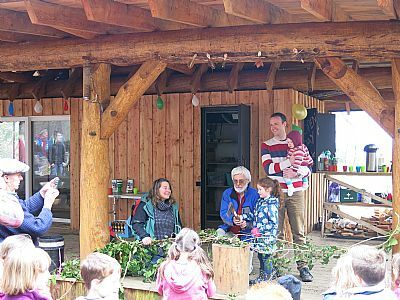 Over 150 folk turned out to have a go at decorating egg balloons then try to shoot them under instruction by archery coach Lorraine Gillespie. 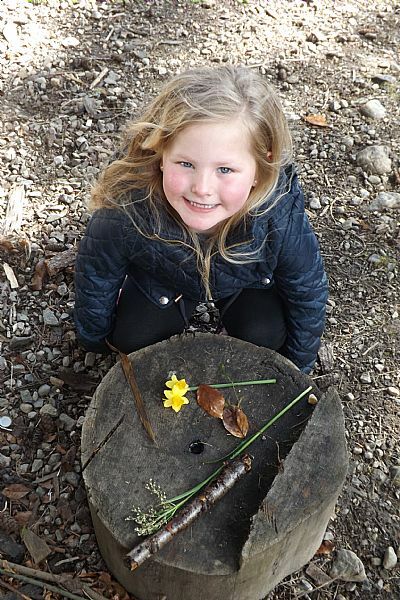 Then it was back to the cabin via a scavenger hunt to claim their eggs. 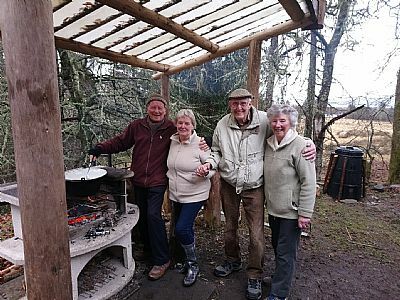 Our woodland chefs cooked up some great soup, pancakes and scones which was enjoyed by all. 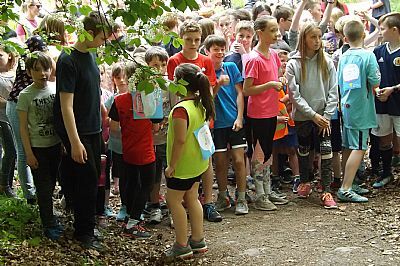 We also raised over £100 to help support the onging work of the woods. Thanks to all. 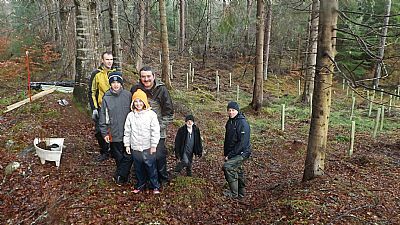 Tain Royal Academy help plant Scottish Native Wild flowers. 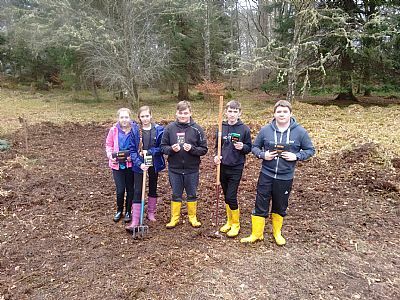 As part of the Kew Gardens 'Grow wildUK' project, pupils from Tain Royal and Dingwal Academies have been preparing ground at Mags wood then seeding with Scottish Wildflower mix. 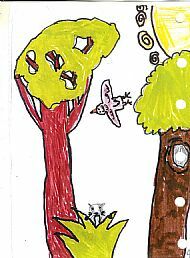 The hope is that a wildflower meadow will develop helping not only the flora but also fauna. It was hard work but well done group. 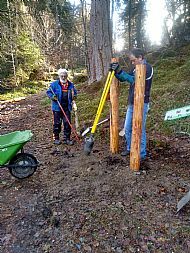 A hardworking band of volunteers helped cut peel and set in place, larch poles which will act as the legs for the new interpretation panel at the bridges over black rock gorge. the next step is to set in place the elm slabs that will act as the backing for the panels. A hard days cutting peeling and gigging but the weather was good as were the biscuits and coffee afterwards. Setting in the uprights ready for the elm panel. 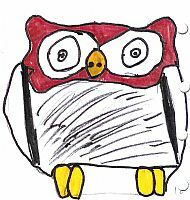 Our regular Tuesday group have been busy ensuring that there is suitable accomodation on offer for our local Owls. 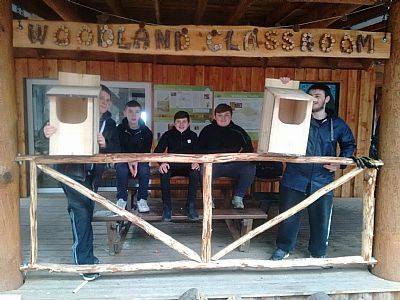 We felled the tumber, the group then milled, measured, cut and built the boxes ready for newly wed Owls to take over. 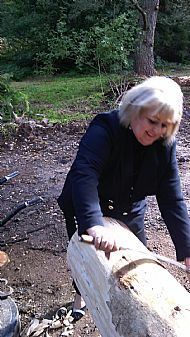 TRA sizing up the logs ready for milling. 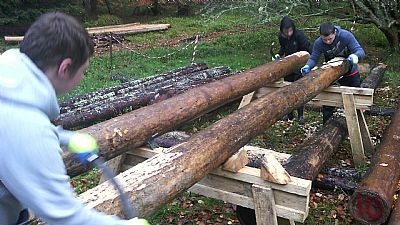 Pupils from Tain Royal Academy have been busy sourcing the best dry wood to help make a giant group 'Bow and Drill'. This is to demonstrate traditional firelighting techniques. 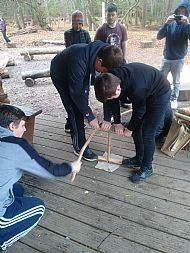 Although the planned fire did not materialise, the group did manage to get lots of smoke and a good work out! Official Tester give new swing the BIG thumbs up. 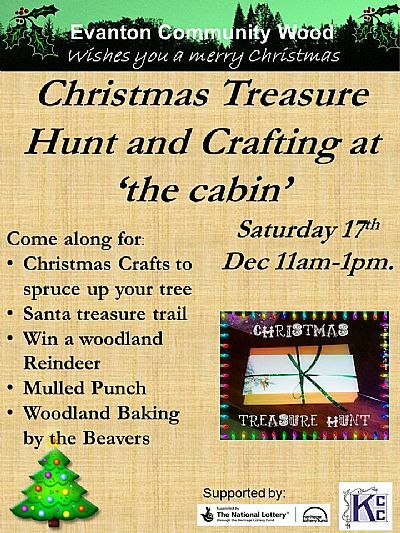 Join us in the woods for some christmas fun.. 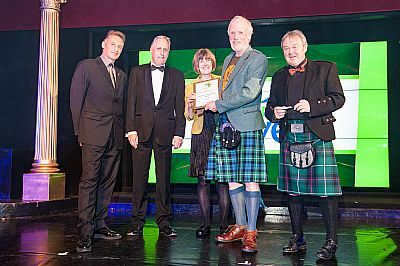 Highly Commended Award at the 2016 RSPB Nature of Scotland Awards (Community Initiave category). Hosted by Chris Packham. 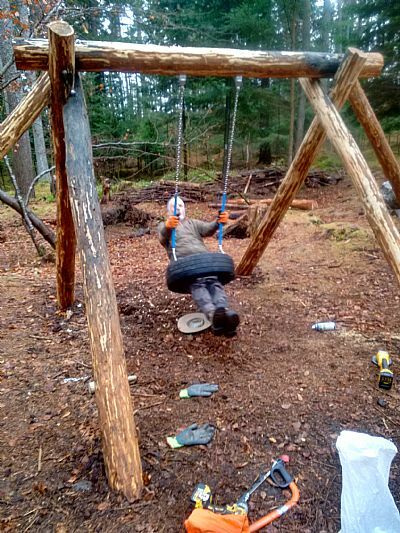 A new addition to the play area -work starts on the swing. 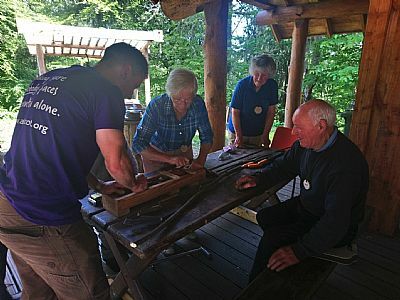 Our Friday Volunteers along with pupils from Tain Royal Academy were hard at work building the frame for a new wooden swing. This is in response to a request by the local nursery groups asking for a small swing for the youngling who visit the woods each week. Thanks again to the CP team for cutting the required lengths of wood. 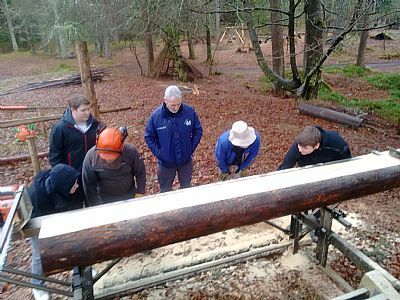 Tain pupils stripping the bark off poles to be used for the swing. 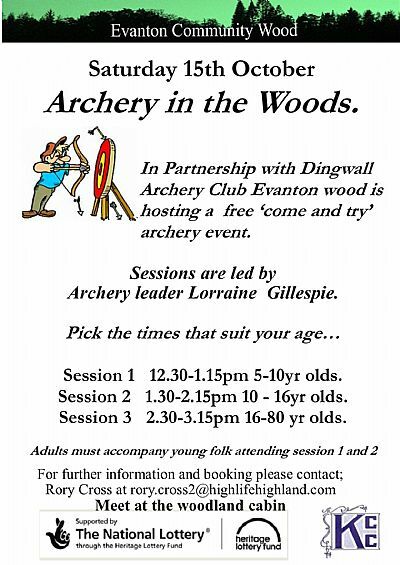 Evanton wood will be featured on BBC Radio Scotland on Friday 4th November. 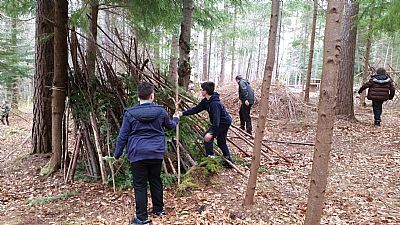 The programme "out for the the weekend" will air a recording of a visit to the woods last week to look at why shelterbuilding is important and such fun. 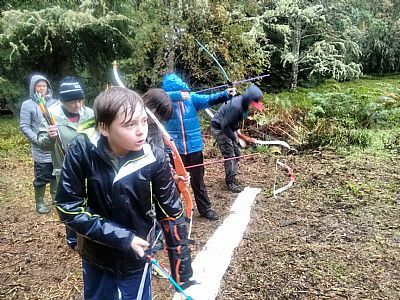 Budding Robin Hood's brave the weather at Archery event. 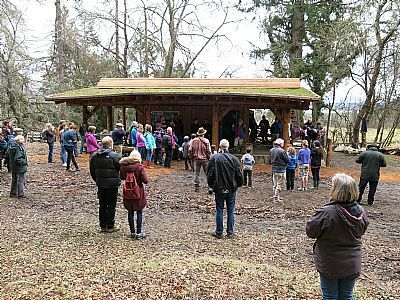 Despite the rain, a good turnout was seen at the archey event. Thanks to Lorrain for spending the day with us showing how to make arrow go in the direction we wanted them to go. 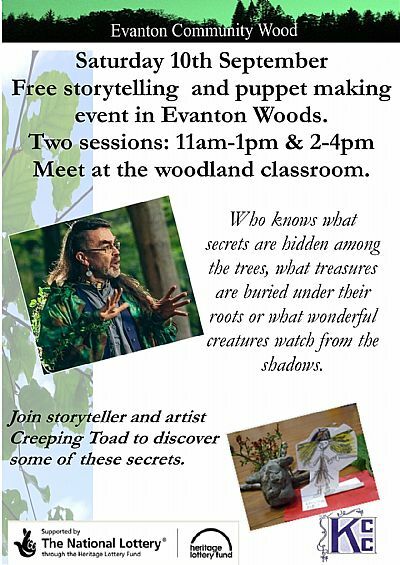 Renowned story teller Gordon Maclellan (AKA Creeping Toad) will be running a free community story telling and puppet making event on Saturday 10th August. The event will have two drop in sessions for anyone aged between 1 and 100. 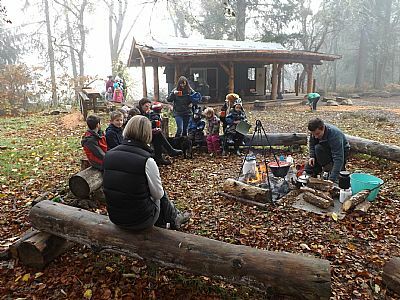 Why not come to the woods and get creative with the family..
ACCESS: (By foot and bike) Chapel Road, enter wood by signed path right of the Chapel; 2 mins to Cabin. Vehicles (not encouraged) via Camden St.
We hope that you might be interested in supporting us. By Aug 2012 we had raised sufficient from elsewhere to meet the target price and to buy the wood. We are now initiating our 5-Year Activity Programme. Following the expressed intention of Novar Estates to sell the 64 ha wood, EWCC (company limited by guarantee no. 332678) was formed in 2007 for this purpose. A Feasibility Study, Business Plan and a Management Plan were completed - all of which point to the viability of community ownership and management. We have since put together a detailed 5 Year Activity Plan. The company has successfully attracted major funding from the Heritage Lottery towards the purchase and a 5 Year programme of activities. 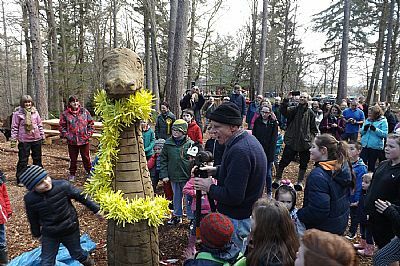 The main match funding has been provided by HIE and Kiltearn Community Counil (NEWS). We are looking additional members, to get involved in our Volunteer Days and training opportunities, family events etc. Highlands and Islands Enterprise funding 22 per cent of the purchase element.